Depending on your U.S. departure city, airlines that service San Jose, Costa Rica include American, Continental, and Lacsa. U.S. firms offering auto rentals include Avis, Budget, Dollar, Hertz, and National. See the Travel Info section for airline and auto rental Web links and 800 phone numbers. Canoe Costa Rica is an affiliate of BattenKill Canoe, Ltd., and offers 1- to 11-day canoeing and hiking tours from January through April. You can obtain a description of scheduled tours and an email link at the BattenKill Web site, or telephone (800) 421-5268 or (802) 362-2800, fax (802) 362-0159. Canoe Costa Rica's tours run from January through April. BattenKill Canoe runs many canoe trips each spring and summer in its home state of Vermont. Click here to read an article on Vermont canoeing with BattenKill. Canoe Costa Rica handles lodging during their canoe tours. For additional travels, there are a variety of lodging alternatives in San Jose and the Central Valley. Country inns are a popular alternative in the other areas of Costa Rica. The Web sites listed below will provide information on a number of these establishments. Fodors Costa Rica and Lonely Planet Costa Rica, provide excellent information for planning your tour, including rankings for accommodations and dining. We particularly appreciated Fodors listing of Villa Tournon as good place to stay in San Jose. These and other travel guidebooks are available through the Travel Bookstore. 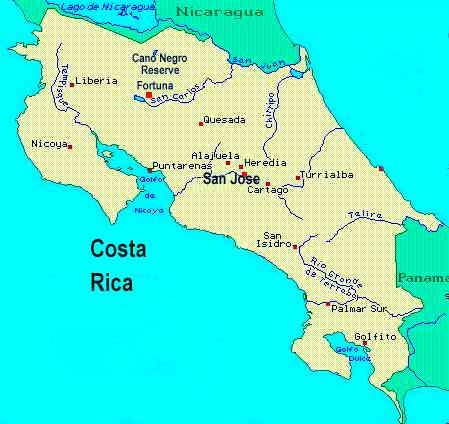 Costa Rica is roughly the size of West Virginia, with a population of 3.5 million, 2/3 of which is centered around San Jose. 25% of the land is in public or private protected status. Costa Rica has the longest standing and purest democracy in the Central America region. Climate in San Jose and the Central Valley is fairly moderate due to the 3,000-4,000 foot elevation. Tropical conditions exist in the lowland areas. The dry season runs from December to April, which is also the busiest tourist season. In general, Costa Rica has a very low incidence of travel health problems, but there is some risk of malaria and other tropical ailments. It is recommended to visit a U.S. travel clinic before traveling. Youll receive information on the current health conditions and can obtain shots or medications appropriate to your personal travel plans. Travel clinics can also give you food and emergency treatment advisories to minimize risk during your travels. 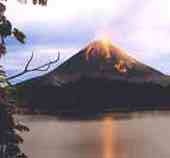 TravelWeb Costa Rica: hotels, cars, etc.